Metropolitan Lawrence called a conference for the clergy of the Archeparchy of Winnipeg on October 4th. The priests and deacons that serve the Ukrainian Catholic parishes around Manitoba gathered at Holy Eucharist Parish church in Winnipeg’s East Kildonan for a series of presentations and discussions on a wide range of topics important to them and the parishes that they serve. Although most clergy celebrated the morning Divine Liturgy at various parishes around the city, some came to concelebrate at Holy Eucharist church in the morning before going down to the auditorium for the conference. Metropolitan Lawrence Huculak, OSBM opened the conference with some selections from the chasoslov (divine office). Those gathered sang the prayers with the inspiring sound that can only be achieved by the many voices of a hall filled with brothers in ministry. After some initial remarks by the Metropolitan, the presentations began. The first to speak was Vicky Adams, the interim contact for the Archeparchy’s Religious Education Centre. She spoke of the new resources available at the Centre - especially audio-visual materials for Scripture study and a program for the study of Catholicism. She is also part of a national team that is developing auxiliary materials to enhance the use of the new Catechism of the Ukrainian Catholic Church – “Christ our Pascha”. These teaching aids could be ready early in the new year. The English edition of the Catechism is now available for purchase from the Chancery Office. The Chancellor, Fr. Michael Kwiatkowski, spoke about the requirements of the Archeparchy’s “Safe Environment” protocols. He reported that all clergy were updated with the various regular checks. Some members of every parish also are required to have background checks and undergo safety training. While all parishes do have such individuals, a new training workshop will be held soon so that others may also receive the training. As Fr. Michael is also the Archeparchy’s “Vibrant Parish” Coordinator, he gave an update on the global Vibrant Parish movement (also known as “Vision 2020”) and what the focus will be for the coming year. We are still in the “Stewardship” phase, but the direction will now lead us into exploring the practical implications of “Diakonia” or the charitable service to others. A conference/workshop of all the eparchial coordinators is being planned for the end of November. During the discussion of “vibrant parishes”, Fr. Volodymyr Bashutskyy spoke of the ongoing mission “parish” at Morden, Manitoba that serves about 200 Faithful that have arrived from Ukraine in recent years. He was given the pastoral responsibility for that community and is assisted by Sr. Oresta Svorak, SSMI and other clergy from time to time. Father Volodymyr also gifted each conference participant with a beautiful full-colour reproduction of an icon of the first Bishop of Canada, Hieromartyr Blessed Nykyta Budka. His parish, Blessed Virgin Mary in Winnipeg, commissioned this icon by a Ukrainian iconographer in 2012 on the centenary of Bishop Budka's appointment to Canada. Discussion also arose about the Extraordinary Jubilee Year of Mercy that was declared by Pope Francis and will be coming to a close in November. Metropolitan Lawrence asked the pastors of the two churches in Winnipeg that have a designated “Holy Door” to report on the activity associated with the Doors over the past year. Fr. Dmytro Dnistrian, CSsR spoke about the Jubilee Year at St. Joseph Parish that also hosts the Blessed Vasyl’ Velychkovsky Martyr’s Shrine. Monsignor Michael Buyachok spoke of the frequent pilgrims to the Cathedral Parish of Sts. Volodymyr & Olga (which, BTW, will be hosting a major Jubilee Year event on November 15th). The Archeparchy’s Vicar for Property, Fr. Mark Gnutel, spoke about the purpose and importance of the “Cathedraticum” that is submitted monthly from every parish to support the activity of the Archeparchy. He also gave a report on what is happening with certain parishes around Manitoba that have long ago ceased to be active. He spoke about the sale of certain properties as well as their designation as heritage sites. He also led a Q&A discussion about the insurance policies and how changes may affect parishes. 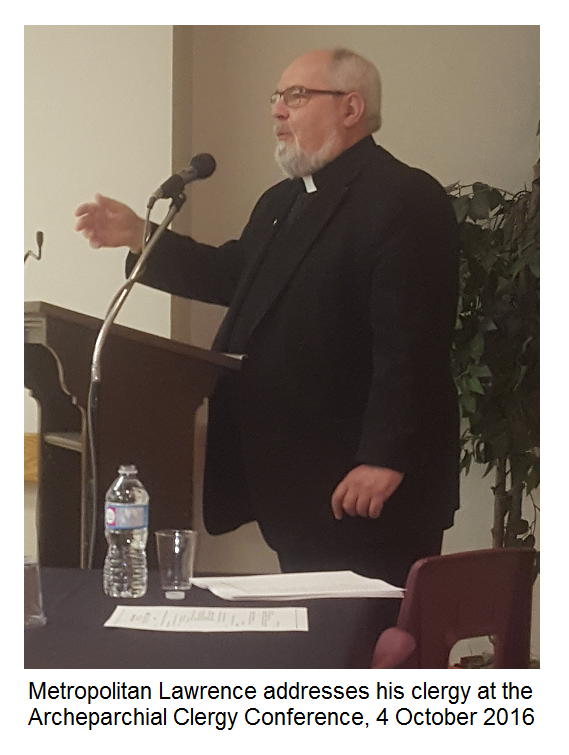 There were a number of other reports throughout the session, including one made by Monsignor Buyachok about the Sheptytsky Institute’s fundraising gala dinner that was held at St. Michael’s College University in Toronto on September 28th. The Head of the Ukrainian Catholic Church from Kyiv, His Beatitude Sviatoslav, was a guest of honour and gave the keynote address at the banquet. The Metropolitan Andrey Sheptytsky Institute for Eastern Christian Studies (MASI) will be moving from Ottawa in the summer of 2017 to Toronto. Mention was also made of the fate of Holy Spirit Seminary also situated in Ottawa. The Seminarians always enrol in MASI academic programs. Will the seminary now also move to Toronto or to another location? Metropolitan Lawrence also informed the clergy that as of the beginning of this academic year, Winnipeg has three seminarians receiving their training and studies in Ottawa. Before the close of the session, Metropolitan invited the clergy to participate in a vote for new members of the Prebyteral Council and the College of Consultors. These are advisory bodies that the Metropolitan convenes to consult for more major decisions. On occasion he may do so on his own accord and sometimes this is required by Church law. He explained that six members of the 12-member body were already designated by their positions or by tradition. This includes such individuals as the Protosyncellus (Vicar General), other Vicars, the Chancellor, the Protopresbyters (Deans) and the Proto-ihumeny (the Provincial Superiors of the major religious orders). The Metropolitan provided a list of the priests eligible for election and asked all the clergy present to use the list as a ballot and mark off three of the candidates that they would like to see serve on council for the next five years. Six candidates will be chosen by their majority vote to complete the number of Presbyteral Council members. His Grace, Metropolitan Lawrence also announced that the Protosyncellus Fr. Darren Kawiuk was now apppointed to serve as the Protopresbyter of the Winnipeg Deanery. A special Jubilee Year Moleben’ “To the Merciful Christ” was prayed in the Church, led by the parish priest. Following this, everyone was treated to a lunch provided by ladies from the parish branch of the Ukrainian Catholic Women’s League of Canada. The next clergy conference will be held in early November. The key presenter will be the chair of the Patriarchal Catechetical Commission, Bishop Peter (Stasiuk, CSsR) from Australia. The theme will be the new Catechism of the Ukrainian Catholic Church, "Christ Our Pascha", the project of which was overseen by Bishop Peter over some twenty years.